Ridley Scott recently returned to the Alien franchise in an arguably more proper way than he did with 2012's Prometheus by releasing Alien: Covenant. People have very mixed feelings about both of the Alien prequels so far, but if lackluster box office doesn't get in the way, we are at least getting one more entry in the franchise. 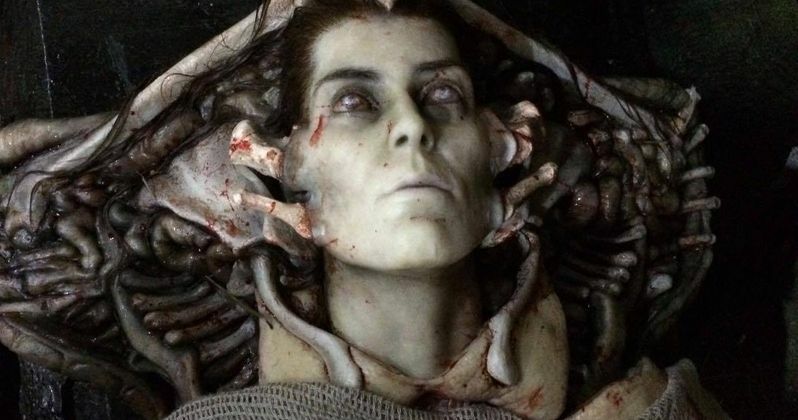 Now, writer Damon Lindelof has shed some light on where the story could possibly go, should Fox give the green light to the Alien: Covenant sequel, which was being called Alien: Awakening last we heard. Warning: Spoilers for Alien: Covenant ahead. Damon Lindelof, who worked on the Prometheus script but did not return to work on Alien: Covenant, recently spoke with Collider, in honor of his HBO series The Leftovers coming to a close. During the conversation he talked a bit about Alien: Covenant and some of what he discussed with Ridley Scott in terms of where the story could go after Prometheus. Here's what he had to say about it. "I think that one of the conversations that we had at the end of Prometheus is, Shaw and David have basically locked in on the coordinates of the planet where the Engineers came from. What does that place look like? Ridley called it 'Paradise'. What happens when they land on that planet? It doesn't feel like they've gotten there yet in Covenant, Covenant felt like it maybe was a detour prior to them arriving at the place of origin so I don't want to spoil any place that he might still be wanting to go, but the conversations that he and I had about where the story goes next were largely about the place where the Engineers were from and less the events of Covenant." We heard way back that the sequel to Prometheus was going to be titled Alien: Paradise Lost, so that gels with what Damon Lindelof is saying here. So, it sounds like maybe what he and Ridley Scott discussed may wind up being the cap to this Alien prequel trilogy. Looks like we may not have seen yet where the Engineers actually hail from, if what Lindelof is saying here winds up being correct. Given how Alien: Covenant left off, it seems perfectly feasible that David could be taking all of his human hosts to meet the Engineers and unleash the Xenomorphs on another unsuspecting population. Ridley Scott has already revealed that the next installment will be titled Alien: Awakening and is being written as we speak. He also said that those events may take place between Prometheus and Covenant, which would allow Shaw to return, fully revealing her fate. But don't hold your breath, Alien fans. Or, at least those of you who liked Prometheus and/orAlien: Covenant. As of right now, the second Alien prequel has made just $175 million worldwide, working from a $97 million production budget. That is less than half of what Prometheus made in total, and things aren't looking to improve all that much. So, it is possible that Fox could rethink their strategy and get in the way of Scott's bullish plans for future Alien movies. If he gets his way, Alien: Awakening will shoot next year, but that is far from a guarantee at this point. One thing is certain: if Alien: Awakening does happen, Michael Fassbender will be back as David. As we saw in Alien: Covenant, he conducted quite a few experiments and was instrumental in the creation of the Xenomorph. Unfortunately, that cost Elizabeth Shaw (Noomi Rapace) her life. Concept artist Matt Hatton recently released some of David's drawings from the movie online that hint at Shaw's gruesome fate. You can check them out below, if you have the stomach for it. These could also hint at what the remaining crew aboard the Covenant have in store, now that David is running things. And possibly what will be seen in Alien: Awakening, if it backtracks as a prequel to Covenant. This is all a little confusing.